GitHub - nozzle/react-static: ⚛️ 🚀 A progressive static site generator for React. Want to be notified of new releases in nozzle/react-static? You are viewing the docs for v7 of React Static. You can browse all historical versions via Github branches! A progressive static-site generator for React. React-Static is a fast, lightweight, and powerful progressive static site generator based on React and its ecosystem. It resembles the simplicity and developer experience you're used to in tools like Create React App and has been carefully designed for performance, flexibility, and user/developer experience. 🚚 Data Agnostic. Supply your site with data from anywhere, however you want! ✂️ Automatic code and data splitting! 🔥 Hot Reloadable out-of-the-box. Edit React components, styles and even data in real-time. Migration from a previous version? What is a progressive static site? A progressive static site is a website where every statically exported HTML page is an entry point to a fully-featured automatically-code-split React application. Just like a normal static site, static progressive websites are capable of loading initial landing pages very quickly, but then extend the user experience by transforming invisibly into a single-page React application. Once a progressive static site page has loaded its React application it can then do amazing things! Anything you can imagine within a React application! Little did you know that when React Static exported your site, it also generated a tiny, optimized, and code-split version of your original React application for every page of your site! After these pages have loaded, React invisibly mounts this application to the existing HTML on the page and... 🎉🎉🎉 You are now using the single page React application you originally built! This application is special, though! While you browse your website, pages that you might go to next are automatically preloaded, making navigation to them instantaneous!. That's just the beginning! 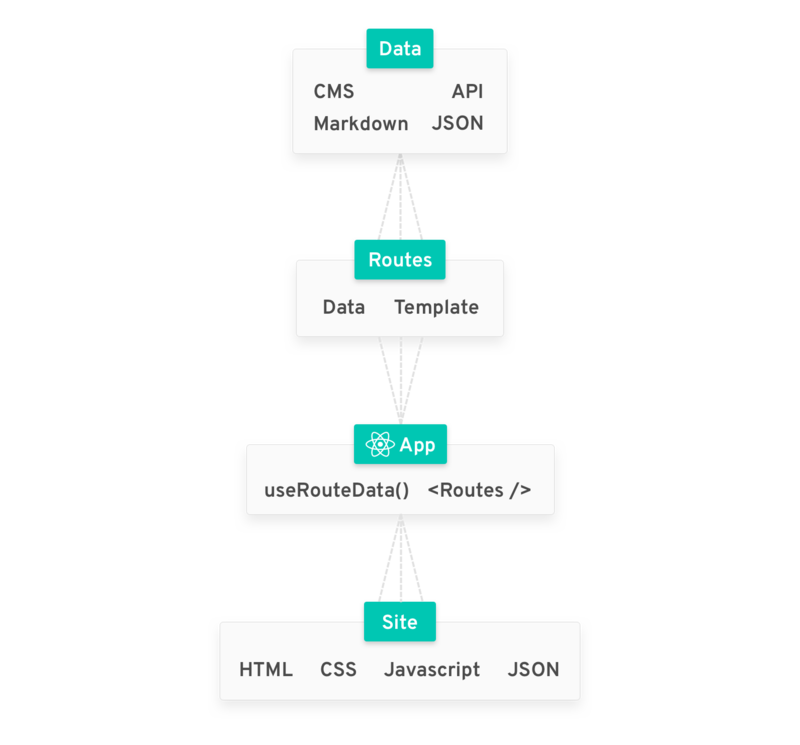 With React Static, you can unleash your creativity and build anything you can imagine with speed and productivity. It even has awesome plugins that will help you on your journey! Coming from Create React App? React Static is also a great replacement for the ever popular Create React App CLI. It provides a similar developer experience, zero-config environment, and features, but without boxing you in. If you ever need to customize your build system in React Static, there is no need to eject! You can use existing plugins or write your own to customize anything you'd like about the build system. Not building a static site? No worries there, React Static works as an SPA too, even if there is only a single index.html file. Need some help? Have a quick question? Click here to sign up for the React-Tools spectrum community! We are constantly answering questions, discussing features and helping each other out! We are always looking for people to help us grow react-static's capabilities and examples. If you have found a bug, or have a feature request let us know! React Static uses the MIT license. For more information on this license, click here.